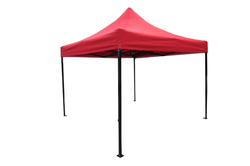 Leading Manufacturer of quick foldable gazebo tent - heavy duty - 10'x10' - red, quick foldable gazebo tent - 10'x10' - blue, quick foldable gazebo tent - 10'x10' - black, quick foldable gazebo tent - 10'x10' - red, quick foldable gazebo tent - 10'x10' - green and quick foldable gazebo tent - heavy duty - 10'x10' - wine red from Surat. Dimensions : 285 x 285 x 200 Cm. Weight - 36 Kg. Can be folded and unfolded in 2 minutes. Hooks provided on 4 corners of fabric to hold rope to tie to fix position of gazebo during high wind flow. 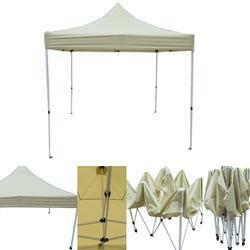 Quick and easy to fold & unfold in 2 minutes ,clear minimum height within gazebo is 6.5' at center ,clear vertical room inside gazebo increases up to 8' on 4 directions from centrer to end of its length and width. ,telescopic legs comes down to 4.5' height in folded condition. Height is adjustable in 3 stages. Nails can be fastened in a hole provided in a welded plate on all 4 legs to hold gazebo securely in position. Can be tied from all 4 directions using ropes to be fastened in hooks on fabric velcro fasteners and hooks on 4 corners provided to hold fabric with frame. Easily washable & 100% water proof. Easy to install. Can stay in position even by its own inertia weight. MATERIALS USED : Frame : made of square tubular powder coated mild steel section. 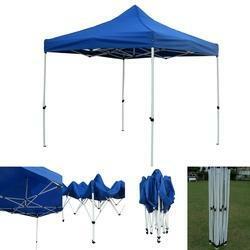 Roof : made of 900D P U coated polyester fabric. Materials Used : Frame : Powder Coated Mild Steel with Nylon Connectors. Fabric -100% Water Proof 600D Polyester with P.U.Coating. Dimensions : 285 x 285 x 200 Cm. Weight - 24 Kg. 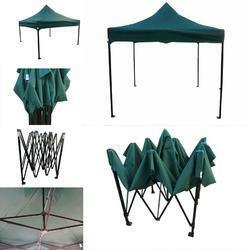 Quick and easy to fold & unfold in 2 minutes ,clear minimum height within gazebo is 6.5' at center ,clear vertical room inside gazebo increases up to 8' on 4 directions from center to end of its length and width. ,telescopic legs comes down to 4.5' height in folded condition. Height is adjustable in 3 stages. Nails can be fastened in a hole provided in a welded plate on all 4 legs to hold gazebo securely in position. Can be tied from all 4 directions using ropes to be fastened in hooks on fabric velcro fasteners and hooks on 4 corners provided to hold fabric with frame. Easily washable & 100% water proof. Easy to install. Can stay in position even by its own inertia weight. MATERIALS USED : Frame : made of square tubular powder coated mild steel section. 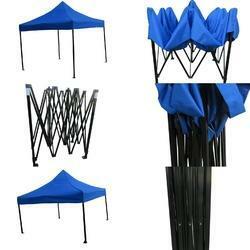 Roof : made of 600D P U coated polyester fabric. 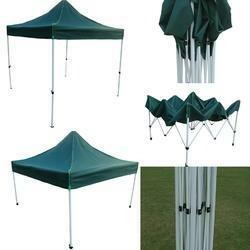 Quick and easy to fold & unfold in 2 minutes ,clear minimum height within gazebo is 6.5' at centre ,clear vertical room inside gazebo increases up to 8' on 4 directions from centre to end of its length and width. 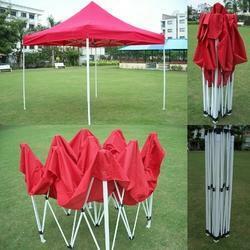 ,telescopic legs comes down to 4.5' height in folded condition. Height is adjustable in 3 stages. Nails can be fastened in a hole provided in a welded plate on all 4 legs to hold gazebo securely in position. Can be tied from all 4 directions using ropes to be fastened in hooks on fabric velcro fasteners and hooks on 4 corners provided to hold fabric with frame. Easily washable & 100% water proof. Easy to install. Can stay in position even by its own inertia weight. Materials Used : Frame : Powder Coated Mild Steel with Nylon Connectors. Fabric -100% Water Proof 900D Polyester with P.U.Coating. Dimensions : 285 x 285 x 200 Cm. Weight - 36 Kg. MATERIALS USED : Frame : made of square tubular powder coated mild steel section. 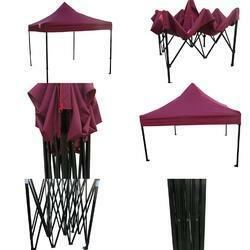 Roof : made of 600D P U coated polyester fabric. Side Walls - 400D PU Coated Polyester fabric.